We love our hand knits and wear them often. And maybe we are even lucky and have loved ones around us that also like to wear what we knit just for them. With all that use sooner or later, we will have to wash an item. And we should wash every piece after we’re done knitting, to relax the yarn, even out the stitches and maybe block it into shape. But many knitters do fear washing their items. What if they shrink? Or felt? What if we end up inadvertently destroying them? I’ve said this before; a hand knit item should always be washed once before it’s ready to wear. While we knit, we are constantly touching it. When we are not working on it, we may have your project in a bag or lying out in the open. It is bound to get a little dirty – even if we can’t see it. Also washing our finished item can make the fibers bloom, make them softer, remove excess color and make your stitches even out. And let’s not forget about how the size might change with washing! How to treat our hand knit can vary depending on the yarn we’ve used, however. Synthetic, cellulose and cellulosic fibers (the latter two are both made from plants but in different ways) are usually okay when we wash them in the machine. 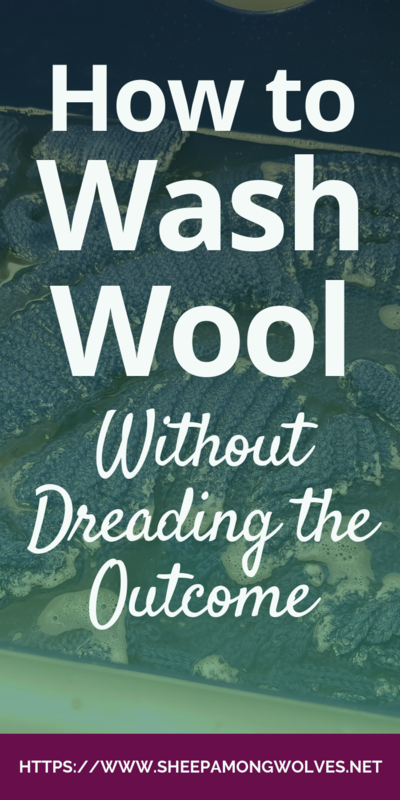 Some wool yarns can also be washed in the machine just fine. Those include most sock yarns (they have to hold up to a lot of wear on the feet, so they should be fine in the machine as well), blends with synthetics or plant-based fibers, superwash yarns and even some pure wool yarns. (Like Holst Garn Supersoft 100% Uld: It’s pure Shetland wool, but I’ve made the experience that if I put it in my machine on an appropriate cycle, it’s completely fine.) If you don’t know how well something will handle being washed in the machine, make a swatch and wash it first. There are some items I would always wash by hand regardless of the yarn. Shawls for one. They are often at a loose gauge and may include lace. I suppose as long as the yarn doesn’t felt you could wash them in the machine using a laundry net for delicates. But I rather wash them by hand and have control over how I treat them. Shawls take such a long time, especially when knitting a lot of lace with a thinly spun yarn that I wouldn’t want to risk it. Items that are featuring a lot of lace, I will also usually wash by hand for a similar reason (except for socks). And anything fair isle since that requires typically a yarn that would felt. Or anything made from expensive fiber, like silk. Again, I just wouldn’t want to risk it. Same goes for any item I have to repair. I always wash those by hand first, gently. The machine would likely make the damage larger and harder to fix. If you don’t know if you can wash something in your machine, you have two options. You can either test it with a sizeable swatch that uses the same stitch patterns as the item you want to wash. Or not risk it and wash it by hand – which is not as much work as it sounds. Find a basin, or use a tub or sink and fill it with lukewarm water. The water temperature shouldn’t be higher 30°C (86°F), but you don’t have to measure it. If the water feels a bit cooler than your skin but not cold or freezing, it should be fine. Now you either use some detergent meant for wool that you could also use in your washing machine or, better yet, some no-rinse detergent like Soak (*) or Eucalan (*). Not having to rinse it out, just removes one step and makes things simpler. Also, you might inadvertently agitate your handknits a bit, and we want to avoid that as much as possible. Your detergent of choice will tell you how much to use, but I find that an amount of about the same size as a hazelnut is usually enough for a sink full of water. I’ve heard of people using shampoo to wash wool. I haven’t done it before but since wool is hair, it should work. I would, however, only use a sulfate free and silicone free shampoo. Silicone just coats your hair to make it look more shiny and healthy and can sometimes even be hard to remove again with the next wash, so I doubt it would be good for wool. Sulfates tend to dry out hair and I cannot see that being good for wool either. I’ve also found this comment on a message board by a hair-dresser and spinner with a bit more information. Put your knits into the bath now, make sure all parts are wet by pushing them under once or twice and let them soak. I usually give them a rest in there for about 20 minutes. A tip from me: Let your knits soak in a place that you will frequently walk passed or visit. Your bathroom sink, for example, or a wash basin next to your coffee machine. Sometimes something will distract me, and I forget that was washing something. But if I let them soak in a place I walk by frequently, I’ll see them and can take them out. A bath for my cardigan. I’m using a laundry basket that I placed in my bath tub. I am only washing that one cardigan because this is the first time I’m washing it and it might release some excess dye. And because I don’t have enough room to dry more than this one piece. 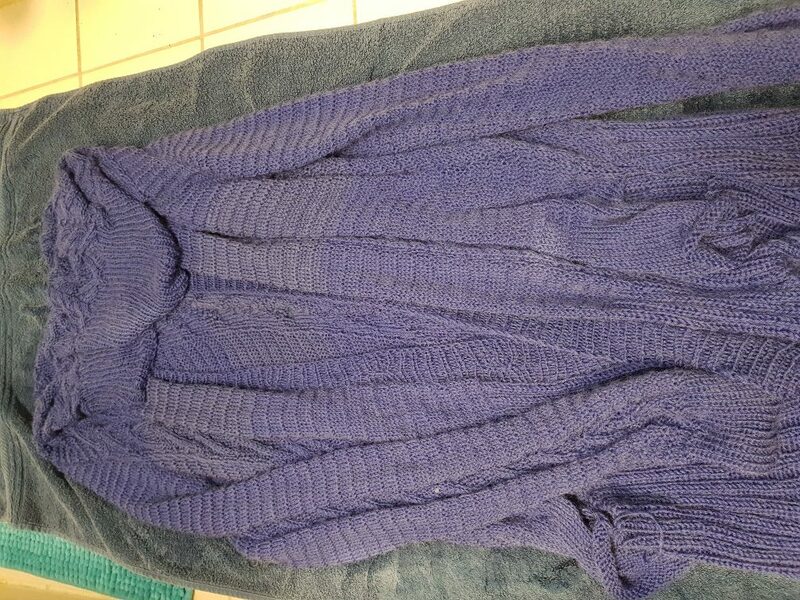 Once you take your handknit items out of their bath, you will have to rinse them if you didn’t use a no-rinse detergent. To do that let cool water flow over it and press the water out gently a couple of times. Repeat this until it stops feeling soapy. Now if you’re done rinsing out (or didn’t have to do it) gently press out the excess water. The knits shouldn’t drip anymore. The key is to be as gentle as possible. 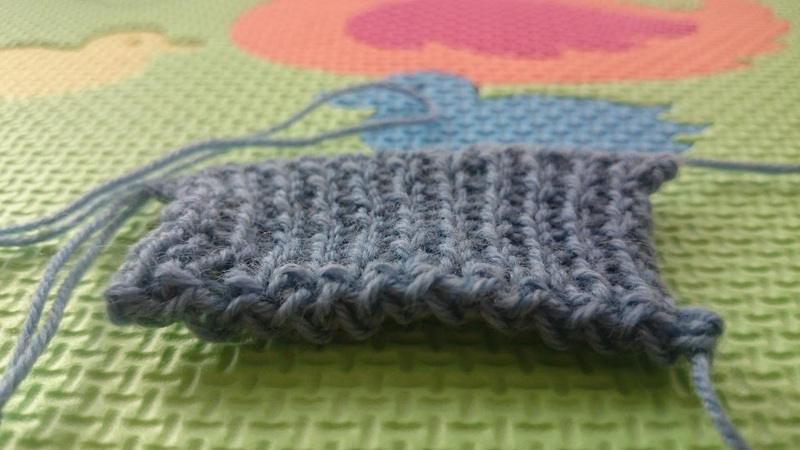 Squish your knits, don’t twist or rub. This is as flat as I managed to lay this cardigan out. But it was good enough. I did this so the cardigan wouldn’t drip anymore when I put it on my rack to dry. Now you need a towel. Microfiber towels are best for extremely delicate yarn that might felt easily but if you don’t have one just use whatever you have on hand. 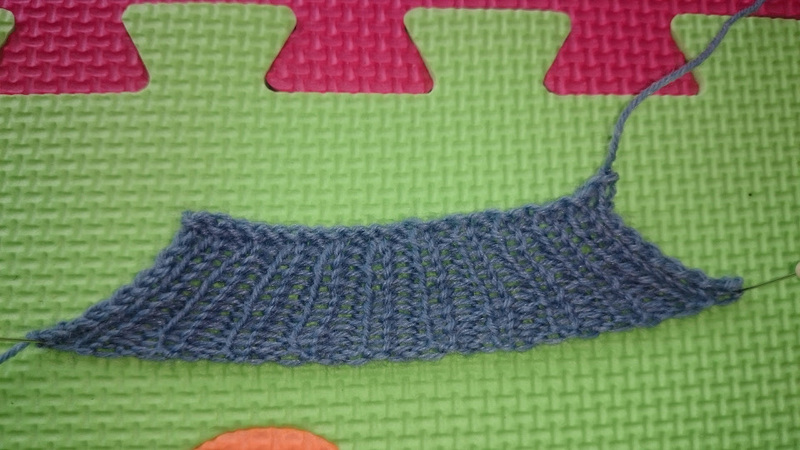 Lay it out flat and lay your knit item on top, also flat and straight. It doesn’t have to be perfect, though. Fold it in a little if it won’t fit otherwise, there should be towel peeking out from under it on all sides. 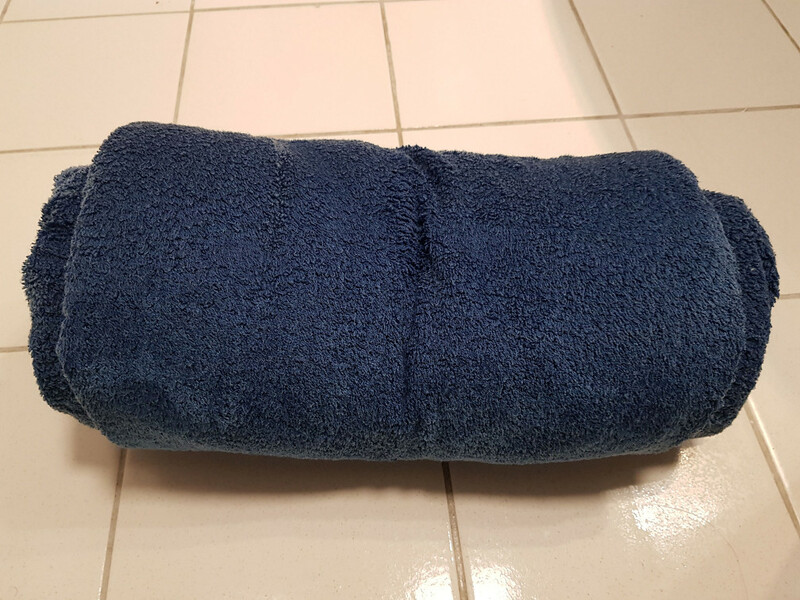 Now fold the upper edge of the towel a little over your handknit, fold the sides in as well and then start rolling it up. Folding in the towel. I want all of the cardigan to stay put within the towel. Then it can’t stretch out if I’m picking it up and the water will end up in the towel and not on the floor. 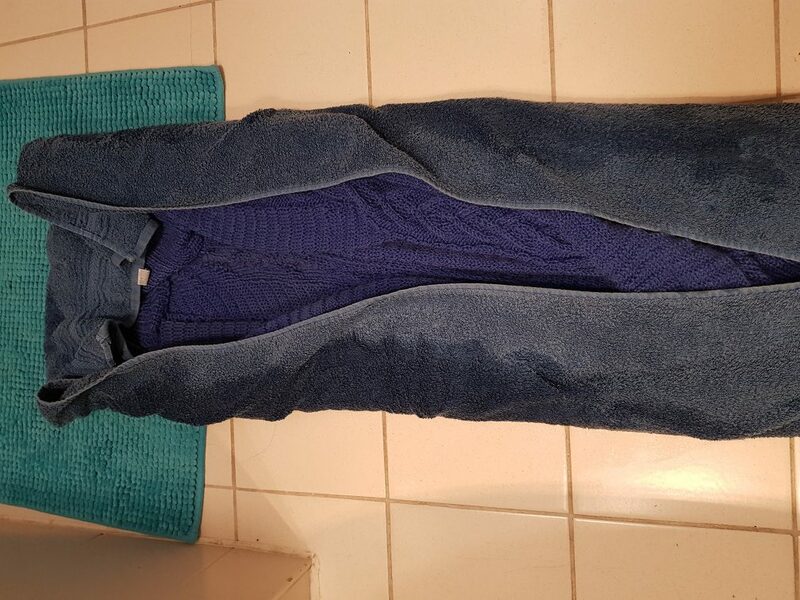 You’ll end up with your sweater or hat (or whatever you are washing) all rolled up in the towel. Now you gently press on the towel to remove even more excess water and then let it rest for a good 15 to 30 minutes. The towel will soak up a lot of moisture, make your knits less heavy and quicker to dry. All rolled up in the towel. Yes, the floor got a little wet as well. The wool had taken in an amazing amount of water and soaked right through the towel. The cardigan weighed a ton. But it wasn’t dripping anymore. If you washed a shawl (especially true for lace shawls), you would have to block it now and leave it there to dry. Hats can also be blocked. Depending on the shape of the hat a plate or balloon might do the trick. Sweaters and cardigans you lay flat to dry. I lay a (fresh) towel on my drying rack and lay the sweater on top of that. But you can just as well use your floor or bed or any other surface you won’t need to use for a little while. If you hand wash items they will take a bit longer to dry. You simply can’t remove as much water as the spinning cycle of your washing machine. How long it will take depends on a lot of factors, like temperature and humidity levels, how absorbent the yarn is and how much water was still left in the item. So keep that in mind when you are choosing a spot for them to dry. Some scarves may need a similar treatment as shawls (depending on their size and patterning), some are fine with simply lying flat to dry. Blankets will also have to lay flat until dry. But most other things can be put over a clothesline or a drying rack. I try not to use any clothespins, however. They can leave impressions in your knits. Now the cardigan can dry. In the end, it took two days. Yes, there is a section in it that’s lighter. I noticed this when I laid it out to dry. I went back to check my ball bands and indeed one of them was from a different charge. Well, there is nothing I can do about it now, so I’m going to live with it. This is the Citadel cardigan by Joji Locatelli by the way. Most modern washing machines come with a wool and silk setting or program. These programs use a slower and more gentle spin cycle (800 rpm or less, less is generally better but removes less water as well) and are no warmer than 30°C (86°F). If I wash something in the machine, I only use this setting. Keep in mind not to use any fabric softeners on wool. They apparently keep the wool from soaking up any moisture off of your skin and can become somewhat sticky and smelly with wear. Some machines may let you skip the spin cycle entirely. That’s likely the gentlest way to machine-wash your knits and as similar as washing by hand as you can get. If you choose to do that, you would then pre-dry your knits as you would for hand-washed items. If you let the machine complete its full program, then you will next have to air-dry your knits. I never put anything knit in the dryer. I’ve heard of people doing it before, but I wouldn’t want to risk it. It’s not that much more work to hang it up (about half of our clothes get air-dried anyway). Besides even in winter when it’s cold and wet around these parts my machine washed knits still dry within about a day. Now, this post got a lot longer than I thought it would. You think there isn’t that much to say about washing your knits but then you go to write it out and end up with more than 1600 words. 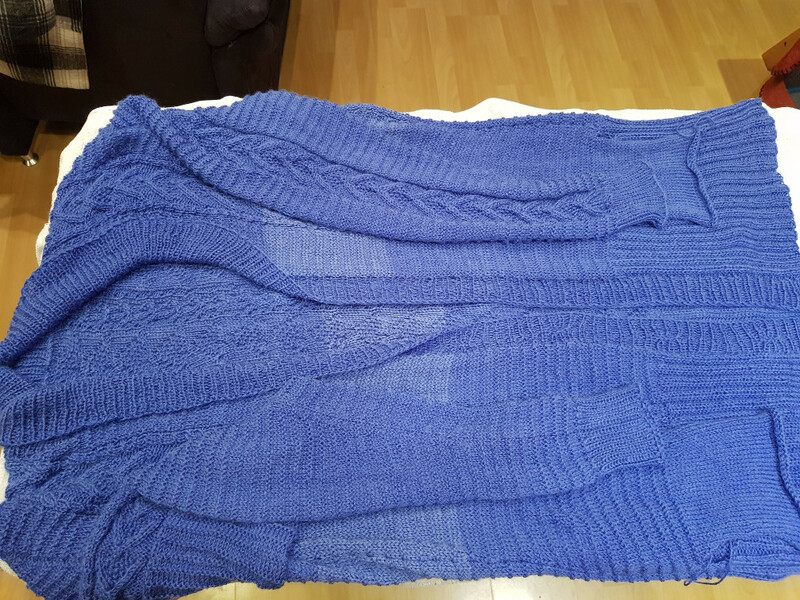 Even so, the process is actually not all that difficult and there is something very satisfying about washing your new hand knit sweater by hand and laying it out to dry. It goes in looking like a mess and comes out beautiful. If you’ve never tried it before, I dare you to. It can actually be kind of fun. And this should be saying something coming from me who hates doing the laundry and is the mom of two small wild wolves/children who manage to get all of their clothes dirty in no time! So far I’ve only managed to accidentally felt one sweater. And I think that happened because I was trying to dye it. In the machine. With dye not meant for wool. 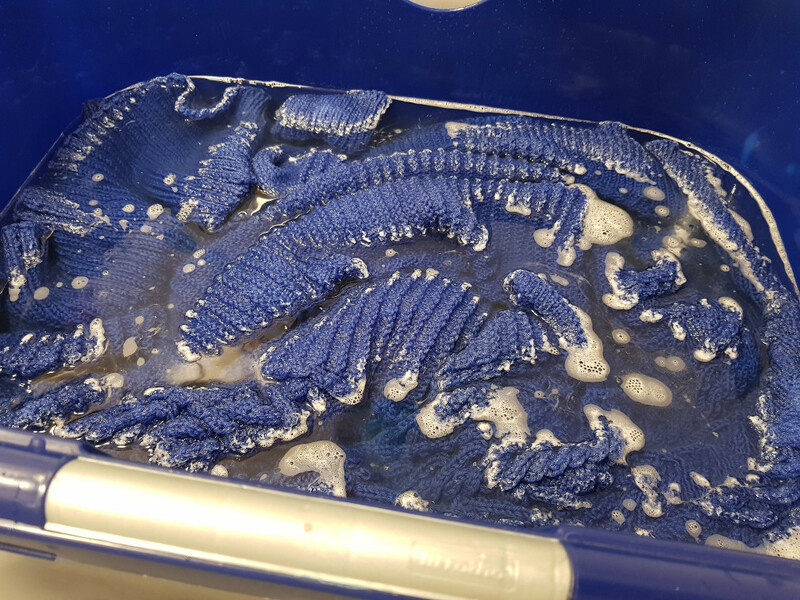 How and often do you wash your knits? Have you had problems washing your items with the machine before? Do you enjoy the process of washing your woolies by hand? Please let me know in the comments below.